This is not a paid or sponsored post. The device was bought by my own money for own consumption. with the tools and process can be dangerous. This post should be construed as theoretical advice only. vehicle, void your vehicle warranty, create a hazardous condition, or harm or even kill yourself or others. This website will not be held responsible for any injury due to the misuse or misunderstanding of the DIY project. During my research most affordable dash cams performed below average when it comes to low light recordings (night). Those which performed to my expectations were above my budget. Then there are those which has good low light capabilities, within budget but no GPS. 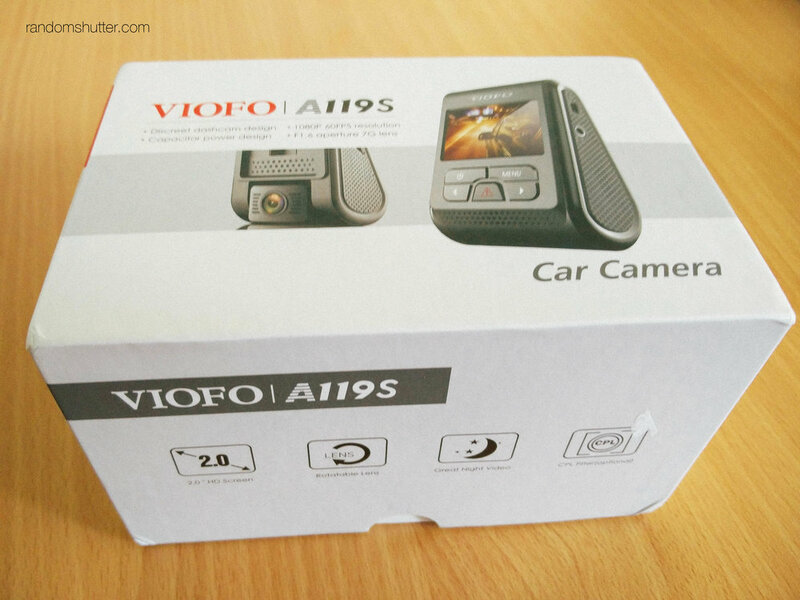 Well, you get the picture, At the time when I decided to buy the Viofo A119s, it had met all my needs. Of course the GPS was an optional module which costs US$10 more (still within my budget). This kit cost me around RM450, including the memory cards and wired power. The box contained many items. Even extra paddings which were needed to be placed to give a snug fit between the camera and the GPS module. 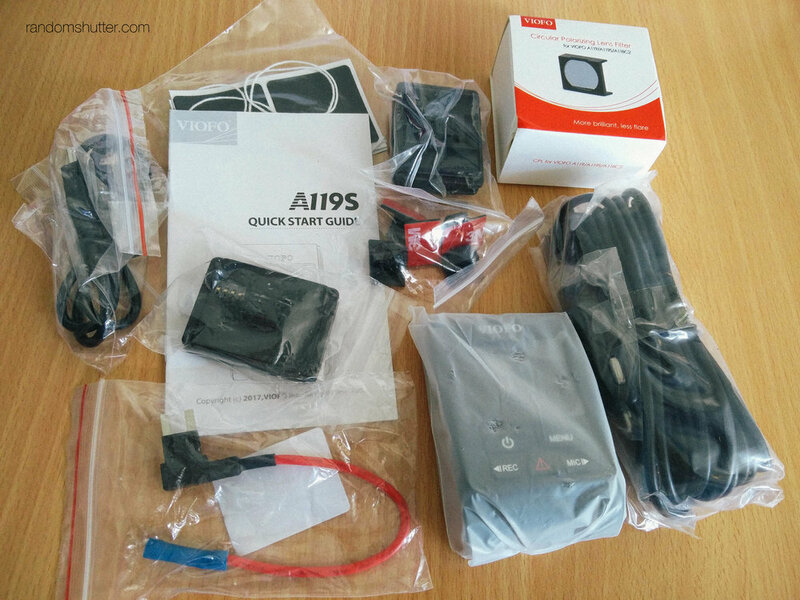 Most dash cams will need a 5v DC power supply which is common power which is used for charging our smart phones. The kit had a pretty long USB Type A to Mini B connector and a two port car phone charger. I did not want to waste a port so I decided to use the optional fuse tap kit. To me its cleaner and its hidden away in the fuse box. Fuse taps essentially function as adapters similar to an electrical outlet splitter. Outlet splitters plug into an electrical outlet and provide one or two additional outlets where previously only one outlet existed. 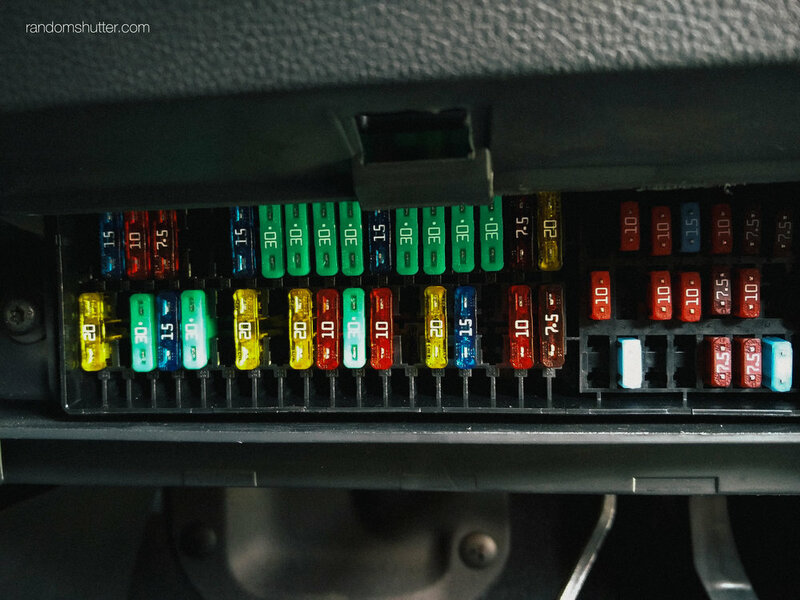 Like outlet splitters, fuse taps plug in to an available socket, so when a car's fuse box is full, it is necessary to remove one of the fuses in order to accommodate the fuse tap. However, because the fuse tap has two circuits that can accommodate two fuses, it is not necessary to permanently remove a fuse to make room for the tap. The removed fuse can simply plug into the tap, while the new fuse has space in the tap's second circuit. Firstly I used a digital multi-meter to find out which fuse was used in the circuit of the cigarette lighter. 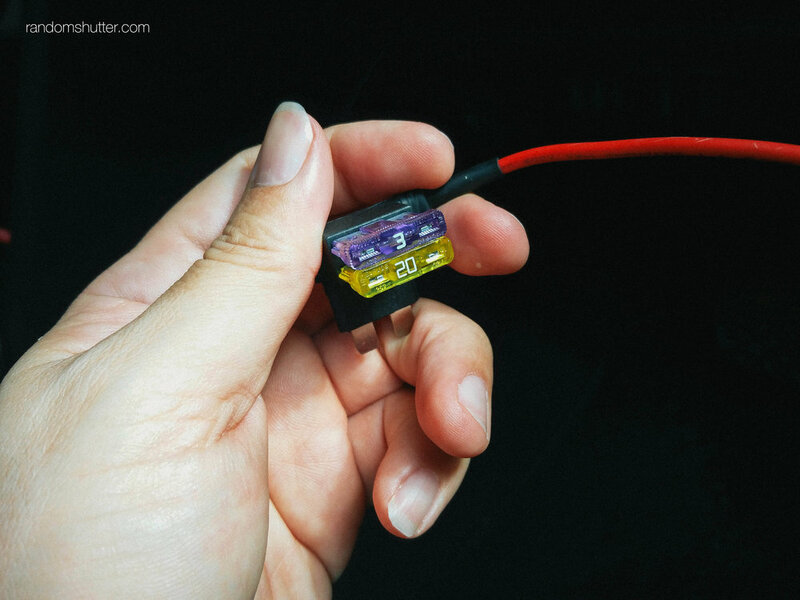 I have read that some use the stereo or even ignition circuit. This process was quite tiring as the position of the fuse box was underneath the steering column which had limited space to work with. Once I located the fuse (cigarette lighter) which I wanted, the 20A yellow fuse on the left of the above picture. Took out the fuse and put it onto the fuse tap. 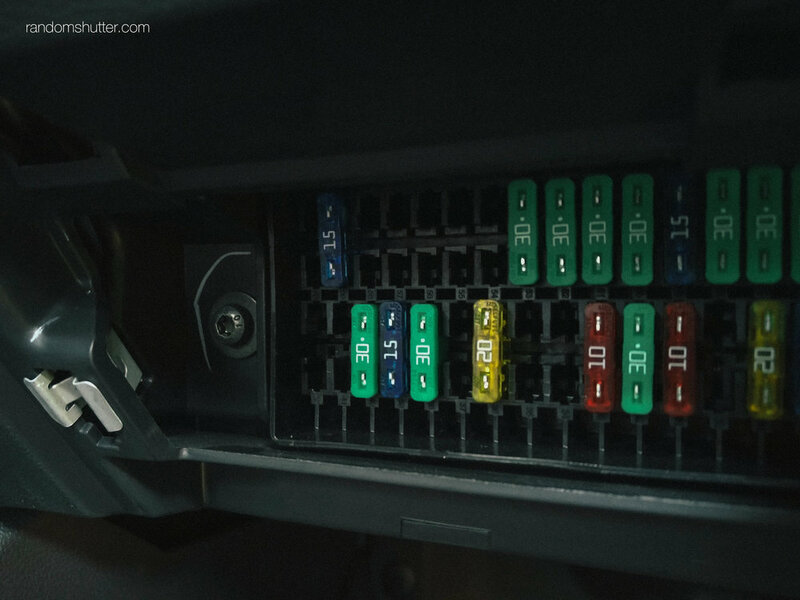 Now the red cable in the picture above is linked to the 12vdc to 5vdc converter that came with the dash cam. Since I had these clip thingys laying around I used it instead. The red wire connected to the fuse tap, and the round cable was well, grounded. the output was routed from the A pillar to the roof lining and to the rear mirror. The image above shows how well hidden the wire is. If I wanted to do better, actually I could remove the A pillar cover and hide the power cable underneath it. But, the cover is really hard to remove, so I will leave it for another time. Now I have been using the dash cam for about a year plus now, it has its quirks. A few months in, it froze and new firmware had to be loaded in, then I upgraded the microSD card, because forums had suggested it would be good for dash cams to use HIGH ENDURANCE cards. Which in theory last longer. So far for now I didnt have much issues, but randomly it will lose time & GPS enabled setting. So ever so often I would have to peek at the screen to see if it was showing the speed (while stationary) to make sure everything is ok. I also had a compilation of videos recorded over first 6 months of 2018, the video is shot at 1080p at 60fps. You can see the night recording and day is pretty decent. During the day you will see a bit of rainbow effect, that is due to the included CPL filter that I used. To me I do not mind it at all. You can also use 3rd party software like Dashcam Viewer to view the GPS data when playing back the video. In case you need it.